NovaBirds Cam Blog: Woodpeckers have arrived on NovaBirds! About a week or so ago, I undertook a small project for the NovaBirds cam! I always love seeing a variety of birds at the other feeders around my yard, and woodpeckers are no exception. I had a bit of a dilemma however. 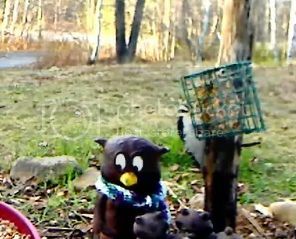 I couldn't figure out how to add a suet basket to my current set-up that would be wood-pecker friendly and also not take away from the natural view of the cam. After a little research, I had a plan: find an old log around the property, dig a hole, put log in hole, add rocks, soil, and voila! A post for woodpeckers! I zip-tied the suet basket mid-way down the log. The best thing about the new feeder addition is that it not only is another food source, but it provides a perch for the birds to hang out on as well! As with any feeder, it took a while for the woodpeckers to find it. The bluejays and chickadees had been snacking on it all to themselves until today, when a large, plump hairy woodpecker finally discovered it and helped himself to a snack! I snapped a quick photo...not the best, but you can see him there off to the side of the suet basket. I'm sure this is just the beginning of the woodpeckers who will continue to visit our new feeder! Keep checking back to the cam, you may be lucky enough to see him yourself!